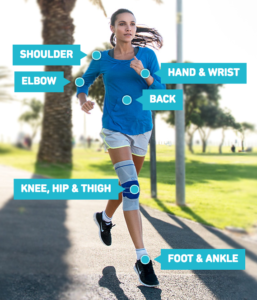 Whether you experience pain in the knees, back, hands, elbows or shoulders, Bauerfeind Train® braces are designed to restore mobility and improve performance. They are made from an anatomically knitted breathable fabric with visco-elastic inserts. As the joint moves, they provide a therapeutic massage and stability. This stimulates the circulation and promotes the healing process. Knee Therapy with Bauerfeind – The Right Treatment For Every Indication. We carry the full line of Genutrain® orthopedic braces from Bauerfeind. Visit the Bauerfeind website then click to book your consultation appointment with Action Sports Clinic today!